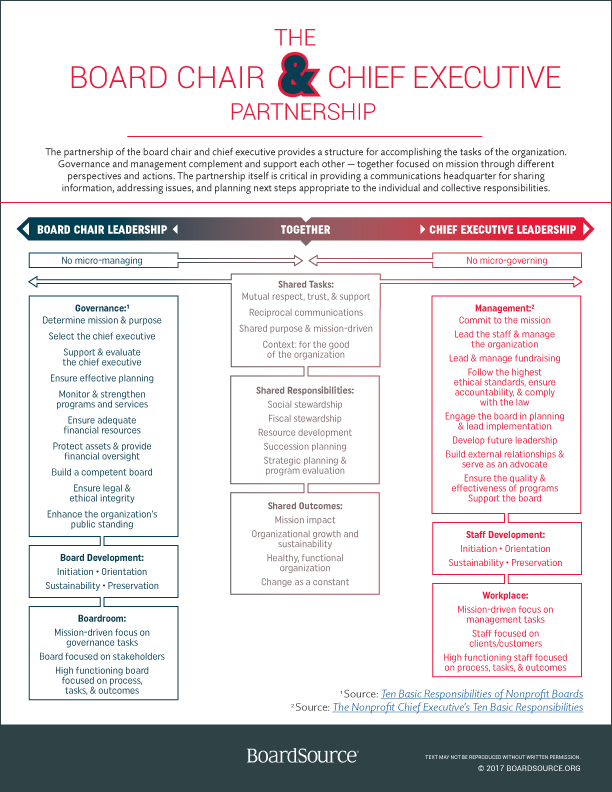 The partnership between the board and the executive leader is critically important to the success of an organization. A strong and healthy board-staff partnership provides flexible and resilient leadership that contributes positively to the organization’s overall impact. A weak or dysfunctional partnership impedes the effectiveness of both the board and the executive, and puts the organization at risk in a number of ways – lack of strategic alignment or direction, executive turnover, a toxic organizational culture; the list could go on and on. Regular check-ins between the executive and chair. Open and consistent communication channels between the executive and the board chair help build a strong working relationship and surface issues and challenges before they get bigger. A commitment to “no surprises.” For both the executive and the board, it’s important to share openly and honestly, including when there’s bad news. This is especially important between the executive and the chair, who set the tone for the relationship between the executive and the board as a whole. Thoughtful reflection on performance. One of the board’s essential responsibilities is to annually evaluate the executive’s performance and provide honest feedback on successes and challenges. Equally important, however, is that the board assesses its own performance. 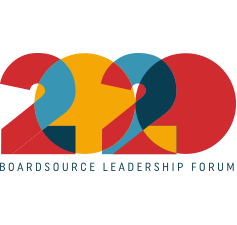 In addition to helping strengthen board performance, it demonstrates the board’s commitment to shared leadership and responsibility. 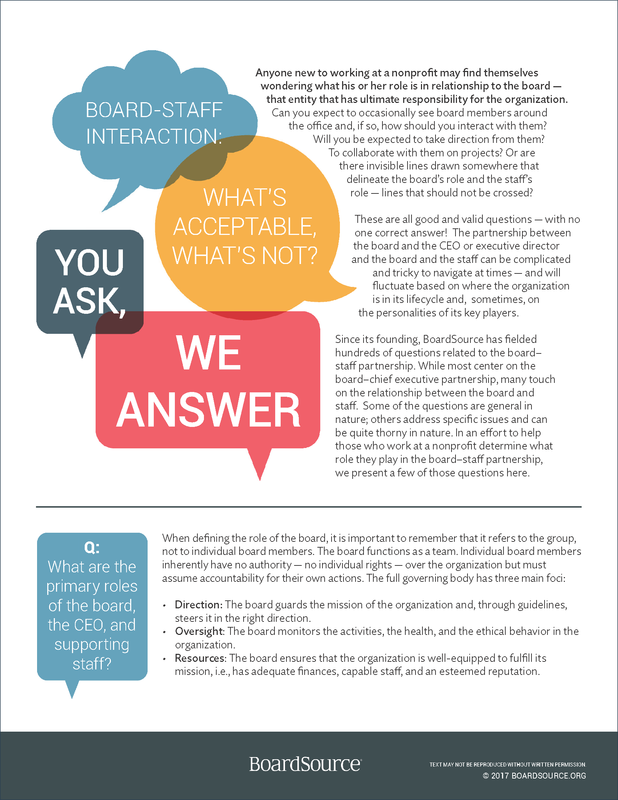 The resources listed below provide guidance on how to develop and maintain meaningful and results-oriented board chair–executive, board–executive, and board–staff partnerships, as well as how to navigate thorny issues such as micromanagement. 201| Members only resource. It is not unusual for unhappy or troubled staff members to contact board members directly about management concerns. How should you address this approach? 201| Members only resource. 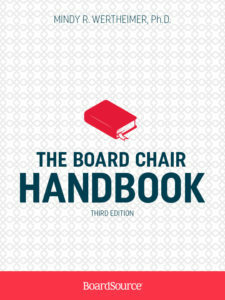 Board chairs play a critical role in ensuring their organization’s health and well-being. 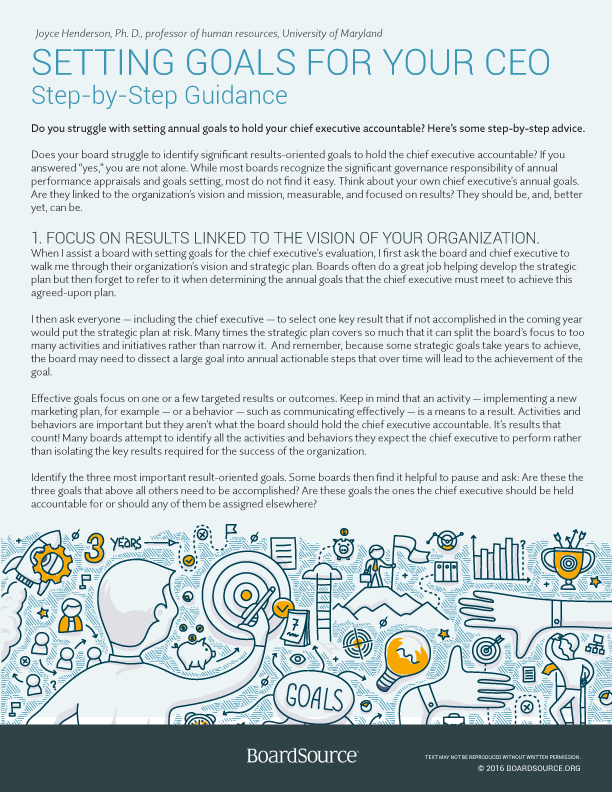 Yet few organizations formally orient or prepare their board chairs for stepping into the role. We expect these individuals to know what to do and how to do it, to simply pick up where their predecessors leave off. 201| Members only resource. It’s real people — with their individual strengths, weaknesses, and interpersonal styles — who bring an organization to life and affect its ability to succeed. And real people who serve as board chairs and CEOs. When attentive to their human factor as individuals and as partners, great things can happen; when inattentive, dysfunction will likely follow. 201| Members only resource. 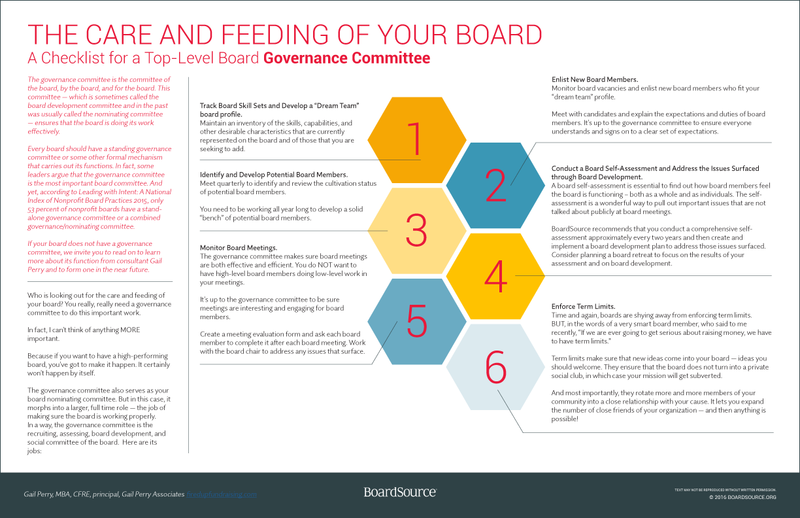 It is not always easy for a board to see the line between management and governance. 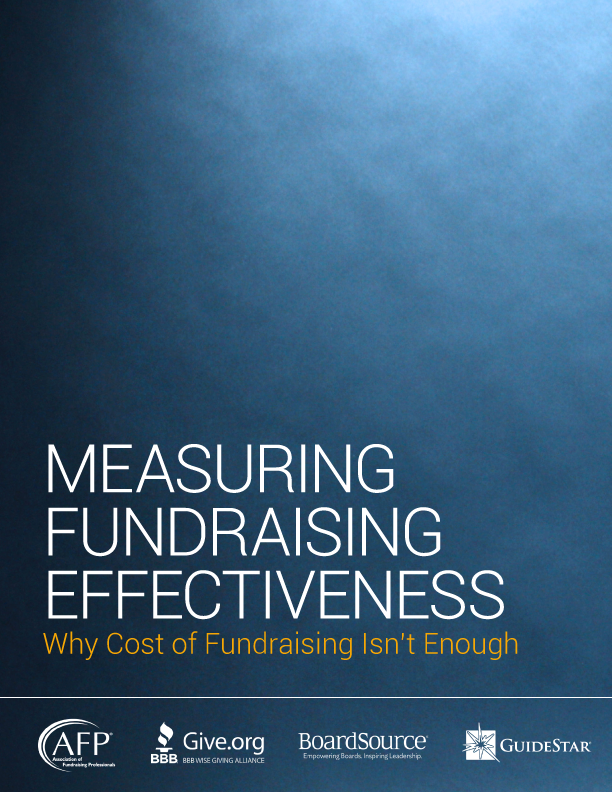 Board members need to consider themselves overseers, not implementers. 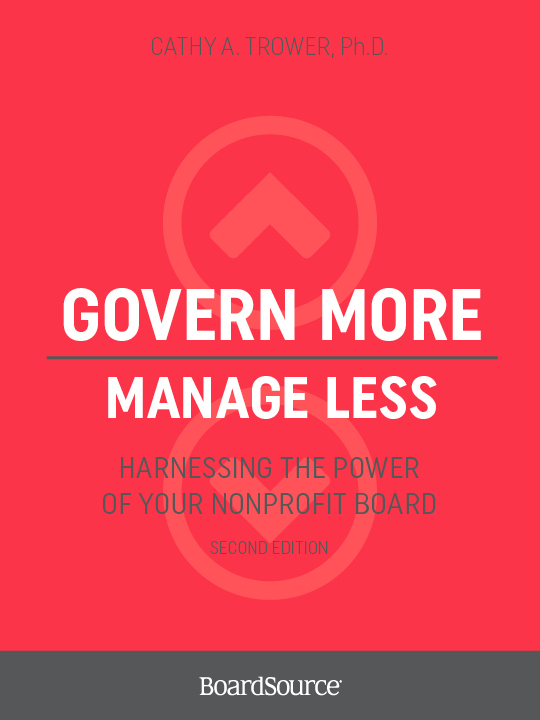 When boards overstep the line between governance and management they can easily become micromanagers. 201| Members only resource. 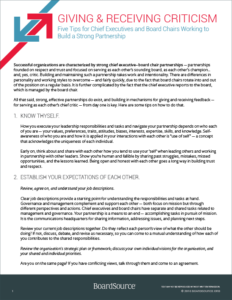 Some organizations traditionally divide the executive leadership duties among two or more individuals. Others choose this option as an innovative way to structure management or to get through a strenuous period before the right person is found to manage the operations. Co-executive leadership­, however, does not come without challenges. Duties and relationships need special attention. Both chief executives and the board must feel comfortable about the arrangement. 201| Members only resource. 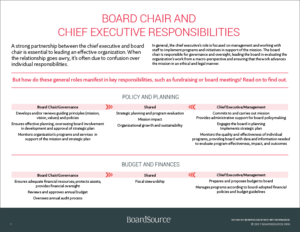 As soon as it is feasible, most boards designate or hire their first chief executive who then manages the daily affairs. The chief executive reports to the board and other staff hired later on report to the chief executive. The structure defines accountability but everyone working together for the same objective is what makes these partnerships succeed. 301 | Members-only resource. 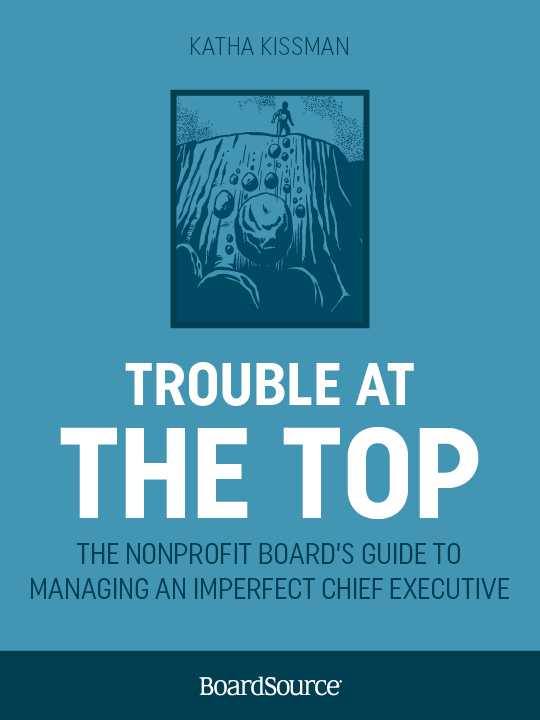 When a nonprofit board faces the painful decision of firing the CEO, it can do great and unnecessary damage to the organization. However, by focusing on mission, integrity, clarity, and accountability, the board is likely to inflict only wounds that heal and, in healing, leave the organization stronger. 201| Members only resource. Serving as the chair of the board is not a role for the indolent and undecided. 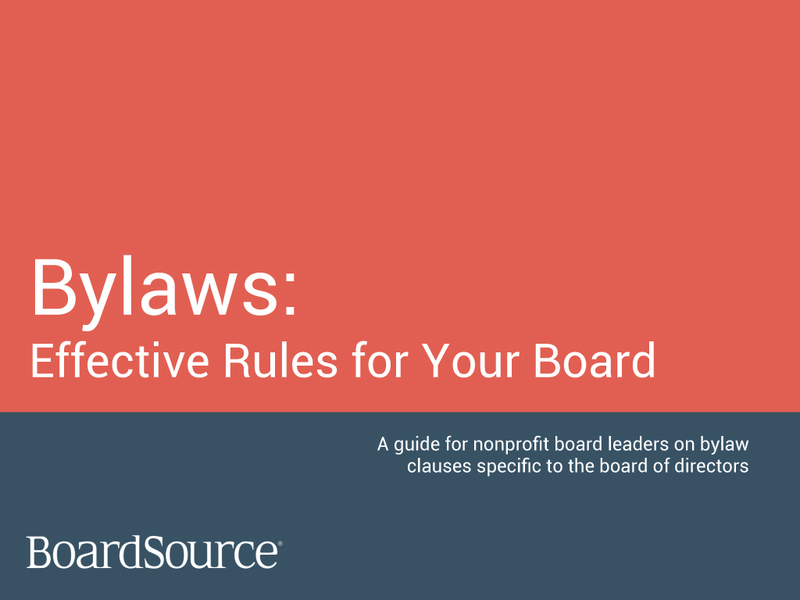 To accept the responsibility to be in charge of a nonprofit board and to serve as an effective leader — not just a figurehead — assumes that the chair possesses the characteristics and conduct that make the job produce results. 201| Members only resource. It is not unusual for a board member to be interested in a staff opening in an organization. The board member may feel that she has the necessary skills and previous experience with this nonprofit. However, when a board member wants to move from governance to management or administration, it is important to follow fair hiring procedures and avoid any preferential treatment. 101 | Community resource. 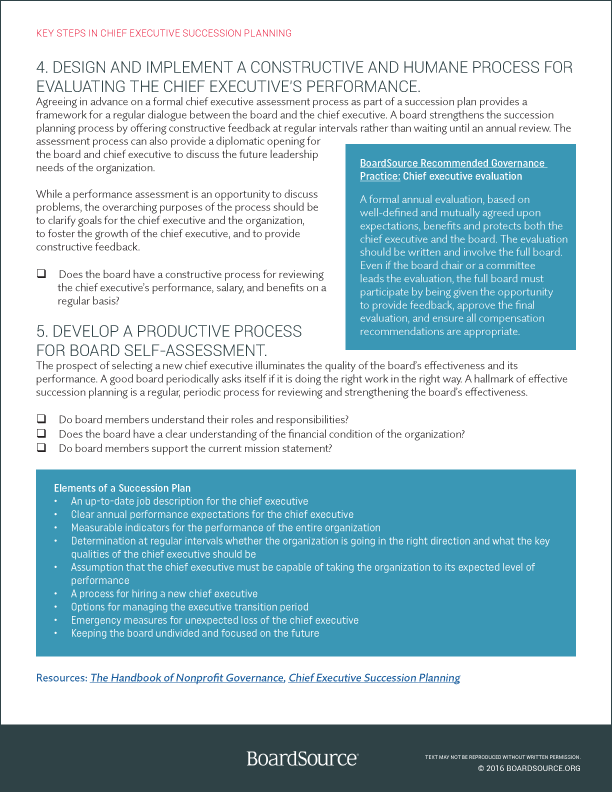 Practicing self-management can enhance the relationship between the chief executive and the board and yield benefits for the entire nonprofit organization. 201| Members only resource. In addition to general leaves for all staff, the board can award special sabbaticals to the chief executive. Some boards also question whether allowing board members to take time off would provide benefit the organization or simply create insurmountable legal concerns. 201 | Members-only resource. 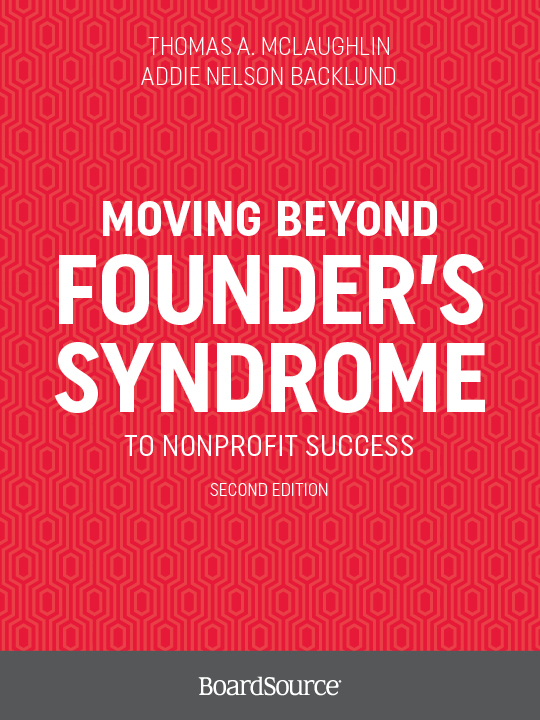 Most nonprofits start as all-volunteer organizations. However, the time will come when hiring staff is a must. 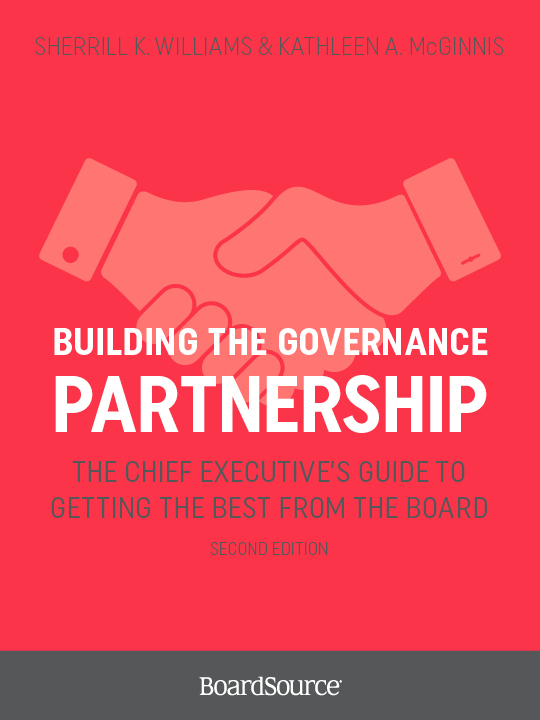 This can liberate the board and allow it to focus on its primary governance responsibilities, but it can also challenge the board in its new supervisory role. 201| Members only resource. 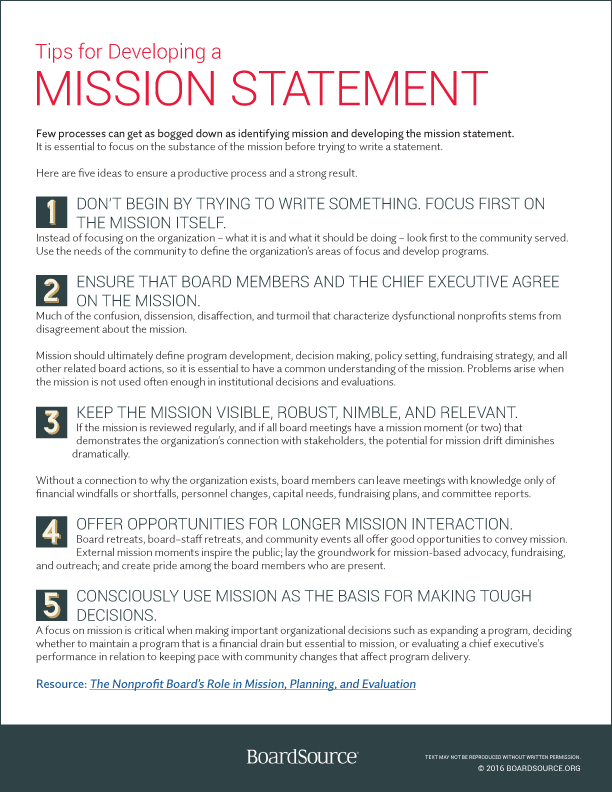 There are many ways to keep former board members involved in a nonprofit. 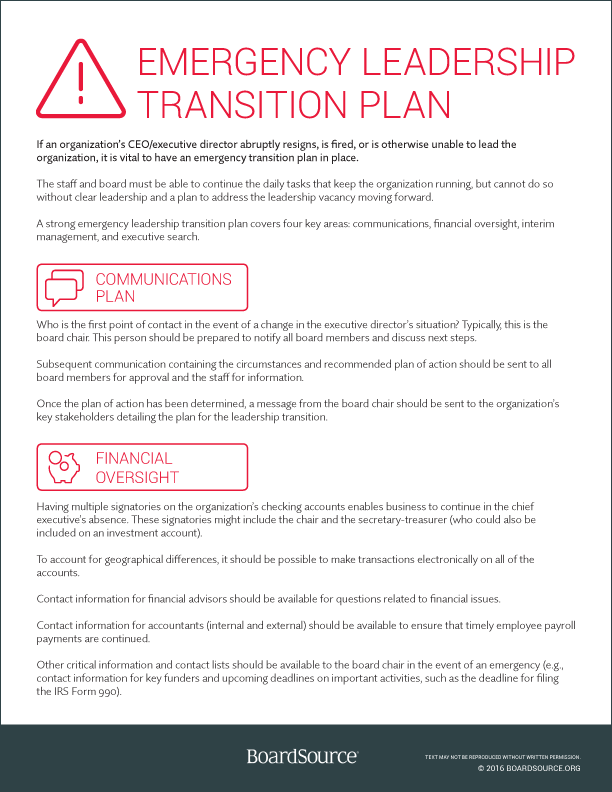 It is more difficult to define the role of a departing chief executive. Is it appropriate to invite him or her to stay in close contact? Should a former chief executive join the board? 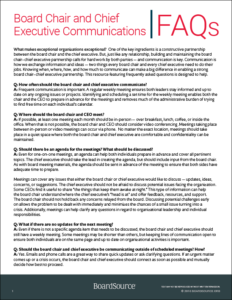 Before answering these questions, it is wise to clarify the relationship between the former chief executive, the new chief executive, and the board. 301| Members only resource. Nonprofit leadership transitions can be risky. Organizations seeking new leadership have, essentially, three choices: grooming an inside candidate, which is fairly uncommon; or seeking an outside candidate either from within or outside the nonprofit sector. This paper will focus on outside-candidate transitions.